This entry was posted on Tuesday, January 29th, 2019 at 12:38 pm. LOCAL woman, Keira Harding, plans to climb Mount Kilimanjaro in September to raise money and awareness for the Meningitis Research Foundation (MRF). It is a challenge of a lifetime for Keira, who grew up in Westbury, and is currently in her second year studying human biosciences at Plymouth University. She will join a team of 25 others for the climb. Keira told White Horse News, “Luckily, I haven’t had meningitis myself, or had anyone close to me suffer from it. “But I have seen lots of such sad stories of people that have, and whilst out fundraising, a lot of people have come up to me to tell me that they have either suffered themselves, or had family members who have. If by raising this money, I can prevent one person from losing their life, or even just raise awareness of it, then it’s definitely worth it to me. “It is known to affect young people predominantly, with 1 in 4 students carrying the meningitis-causing bacteria. That is why it is important for me to raise awareness of meningitis; many students don’t know the severity of the disease and the damage it can cause. Keira has been fundraising in order to reach her target of £3,380 before the trip. 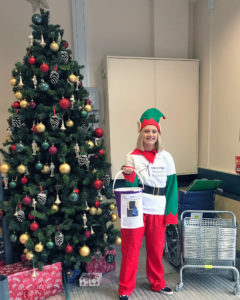 She recently held a collection at Morrisons in Westbury where she collected £861.54. “I’d like to thank everyone who donated in Morrisons for their generosity.” said Keira. “I will also be attending regular street collections whilst at university but hoping to visit another supermarket, as Morrisons was so successful. Keira will be hosting a quiz night and raffle in aid of her fundraising on Saturday 20th April at Westbury Leigh Community Hall. Entry will be £5, with great prizes up for grabs. Maximum of 6 people per team. To donate to Keira’s cause, visit https://plymouth-kili-2019.everydayhero.com/uk/keira-climbs-kilimanjaro. To share fundraising ideas, you can contact Keira on keiraharding607@gmail.com.